1. Ankylosaurus had a bumpy back of armor that protected him from his predators. Predators could not penetrate his tough back. He also had a very powerful tail. Ankylosaurus was about 18-20 feet long and six foot high. 2. Apatosaurus means deceptive lizard. Apatosaurus was about 18 m long and weighed about 30 tons. It had a very small brain. 3. 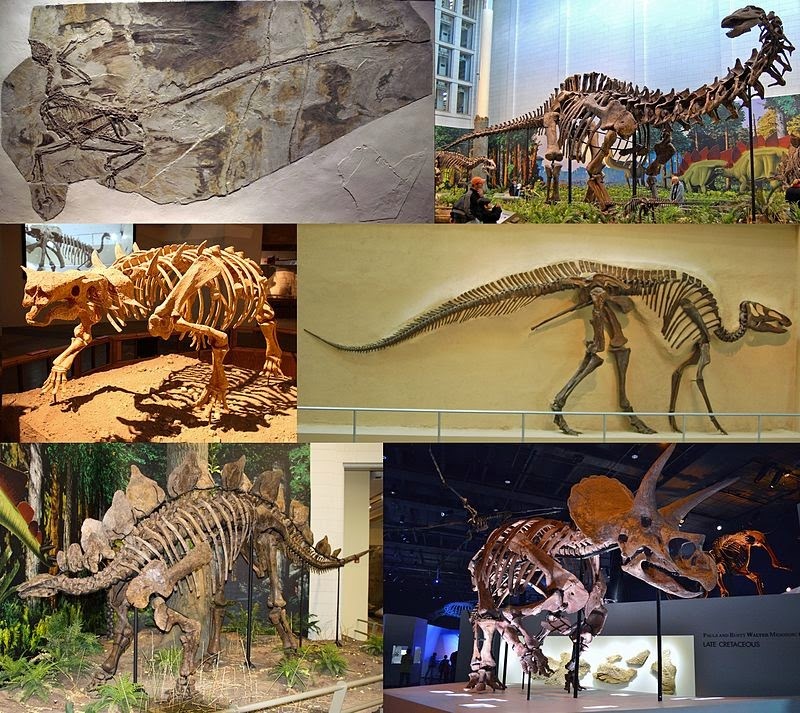 Dinosaurs ruled the Earth for over 160 million years, from the Triassic period around 230 million years ago through the Jurassic period and until the end of the Cretaceous period around 65 million years ago. 4. It is believed that dinosaurs lived on Earth until around 65 million years ago when a mass extinction occurred. 5. Scientists believe that the event leading to the extinction may have been a massive asteroid impact or huge volcanic activity. Events such as these could have blocked out sunlight and significantly changed the Earth’s ecology. 6. A person who studies dinosaurs is known as a paleontologist. 7. Rather than being carnivores (meat eaters), the largest dinosaurs such as the Brachiosaurus and Apatosaurus were actually herbivores (plant eaters). 8. To help fight meat eaters such as the Allosaurus or Spinosaurus, many plant eaters had natural weapons at their disposal. Examples of this include the spikes on the tail of the Stegosaurus and the three horns attached to the front of the Triceratops’s head shield. 9. The biggest carnivores were theropods from the Cretaceous Period. An example is Tyrannosaurus rex. 10. One of the largest known complete dinosaur was Brachiosaurus (“Arm Lizard”) which reached 82 ft (two large school buses) in length and 42 ft (a 4 story building) in height! 11. One of the smallest dinosaurs was slightly larger than a chicken. Compsognathus (“Pretty Jaw”) was 3 ft long and weighed about 6.5 lbs. 12. Today, only whales are close in size to the largest dinosaurs. 13. At present over 700 different species of dinosaurs have been identified and named. However palaeontologists believe that there are many more new and different dinosaur species still to be discovered. 14. The term dinosaur comes from the Greek language and means ‘(“Terrible Lizard”) was coined by the English anatomist Sir Richard Owen in the early 1840’s. 15. Dinosaurs had replaceable teeth; when a tooth was lost or broken, another one grew in to take its place. 16. Various dinosaurs lived on Earth for about 165 million years. In comparison, humans have only been around for about 1 million years. 17. The duck-billed hadrosaurs (an example is Parasaurolophus) had up to about 960 teeth -the most of any dinosaur. 18. When the first dinosaurs were alive, the formation of the continents was one big super continent called Pangaea. 19. The biggest dinosaurs were sauropods, gigantic, slow-moving, small headed plant eaters from the late Jurassic and Cretaceous periods. 20. Hadrosaur nests have been found complete with fossils of babies. The babies have slightly worn teeth, suggesting that they were probably fed by their parents. 21. Although Stegosaurus was about the size of a bus, it had a small head (the size of a horse’s head) and a brain that was only the size of a walnut! 22. Ankylosaurus had a bumpy back of armor that protected him from his predators. Predators could not penetrate his tough back. He also had a very powerful tail. Ankylosaurus was about 18-20 feet long and six foot high. 23. Apatosaurus means deceptive lizard. Apatosaurus was about 18 m long and weighed about 30 tons. It had a very small brain. 24. The first dinosaur to be described and named was presented in 1824 as the ‘Megalosaurus or great Fossil Lizard of Stonesfield’. The author of the scientific paper was William Buckland, professor of Geology at Oxford. 25. Dinosaurs were reptiles that lived on land; they did not fly like the pterosaurs, or swim like the plesiosaurs and ichthyosaurs. Their legs were held directly underneath them; other reptiles, like crocodiles and lizards, walk with their legs held to the side of their body.